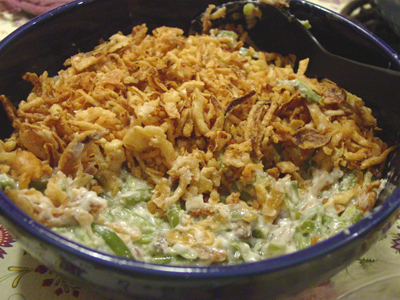 Kicked Up Green Bean Casserole: pretty, by casserole standards. I’ve never been a fan of the traditional green bean casserole but Shane really likes it, so I’ll make it on occassion — most recently, for Thanksgiving. I’m not crazy about green beans anyway, and the regular recipe yeilds a bland-tasting and grey-looking casserole. For Christmas dinner, however, I set out to find a better recipe — and I did! Not only is it delicious, with loads of onion flavor, it’s creamy and even attractive (by casserole standards, anyway). It only requires a couple of extra steps and ingredients, but it makes all the difference (plus, it actually comes together more quickly than the original). They’ve taken a casserole I normally turn my nose up at into something I crave in the middle of the night — or right now, even. Blanch the French-cut green beans in hot water for about 3 to 5 minutes, drain and set aside to cool. In a large skillet, saute the chopped onion in butter. Then add the cooled beans and saute for a couple of minutes. Add the canned mushroom soup and mix well. Season with salt and pepper. Transfer to a greased casserole dish and top with French-fried onions. Bake in oven for about 10 minutes.